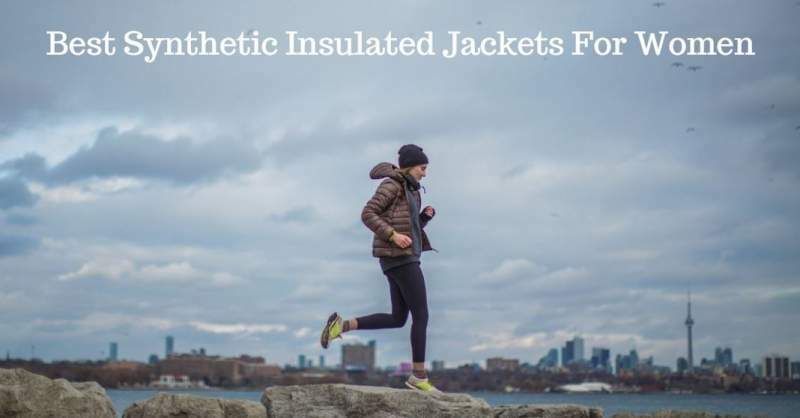 Here you have the list with the best synthetic insulated jackets for women for the coming 2018-2019 winter season, all top brands and with advanced materials used in their construction. Synthetic insulation preserves its insulation properties even in damp conditions and when it gets wet. It is therefore suitable for technical jackets used for aerobic activities by outdoor enthusiasts. If so, then they are great for a casual use as well. So I thought you might want to have the latest best models in one place, hence this list. So what is included in the list? Some of the jackets are designed as outer layers only, but most of them can be used on their own or as underlayers as well. All of them are by the top brands in this industry. Those are jackets constructed from advanced materials. So do not be fooled when you see how tiny and lightweight some of them look. Those are technical jackets with lots of laboratory testing behind, designed to protects you even in very harsh conditions. You will see some example of a synthetic-wool blend. Arc’teryx Women’s Atom SL Hoody. If you are not familiar with the Arc’teryx terminology, first to explain some of the words in the name. 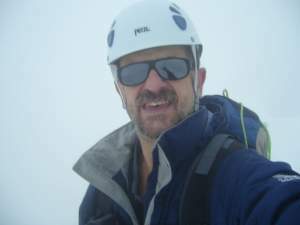 The word Alpa they use for their insulated jackets that are designed for climbing and alpinism. So these are highly technical items. The letters SL mean Super Light, and indeed this jacket weighs only 8.3 ounces (235 g). It is very compact when compressed, and you can always have it as an extra layer in the pack. It is with the highest possible durability-to-weight ratio, its pockets are designed to be accessible while wearing a pack or harness. The length and the waistline are harness compatible and the design is with articulation for overhead motions. This is a Hoody as the name says, so you have a helmet-compatible adjustable hood, but note that it is not insulated. The jacket itself is lightly-insulated and it is perfect as an outer layer for mild weather, but you can also use it as an insulating inner layer under a shell jacket in colder weather. The outer fabric is soft and lightweight Tyono 20 100% nylon with a durable water-repellent finish. The side stretch panels are different, you have Torrent 190 with Polygiene 84% polyester, and 16% elastane. The insulation is synthetic Coreloft 40 gram insulation and it is only in some sensitive areas, so you do not have it on shoulders and on the arms. This is a quick-drying material which will retain its insulation property even if it should become wet. You have gusseted underarms and articulated elbows as you would expect from such a technical jacket. This famous Nuuk Parka has been on the market for more than 5 years already, tried and tested, and all is known about it. You have a classic design with all modern features against cold weather, for a waterproof, breathable, and warm performance. The shell is a highly-durable polyamide with a PU membrane, they claim it is completely waterproof, and it is very soft as well. The liner is polyamide and polyester for an internal comfort. In between, you have a lofty Supreme Microloft synthetic insulation. They are proud of the fact that their products are fluorocarbon free. You have an adjustable, insulated, and fleece-lined hood with a removable synthetic fur edging which you see in the picture above. Note that you have a drawcord adjustability at both the waist and hem, and the cuffs are with Velcro closures. Now, the pockets are a special story here, you have them 12 in total. I do not remember seeing any jacket ever with such a number of pockets. Two top loading bellows pockets with snap buttons. Two pleasant zippered fleece-lined hand pockets. One media sleeve pocket with a snap button. One secret zippered internal pocket behind the front zipper. Two large stretch mesh interior pockets. One additional small interior pocket. This jacket is currently available in 5 different colors. I see it best used as a casual jacket, but it is also good enough for hiking. 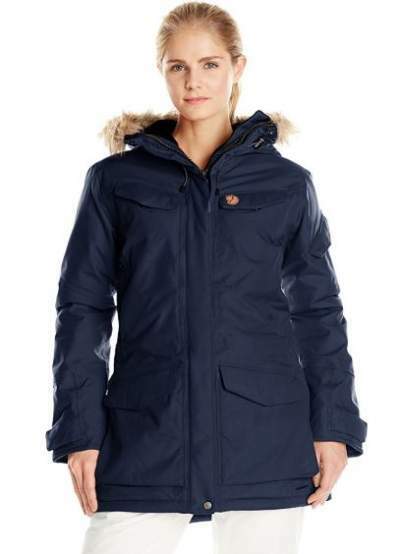 Fjallraven Women’s Raven Padded Jacket. Here you have the insulated Fjallraven Women’s Raven Padded Jacket which is designed as a piece to wear on its own as an outer layer. The style is such that it can be used casually in an urban environment as well as an outdoor piece. The external fabric is G-1000 Eco, a durable and abrasion-resistant blend of polyester and cotton (65% polyester and 35% cotton) which they claim is UV-protective as well. It is wind resistant and by applying wax you make it waterproof as well. They have their own brand Fjallraven Greenland Wax which can be ordered separately. You have a lightweight 80-gram Supreme Microloft polyester insulation which is 50% recycled. The hood is included and it is adjustable. When not in use you can roll it into the collar. The front zipper is a two-way type full-length and protected with a wide flap and you have snap buttons as well. The hem is with a drawcord, and sleeves are with snap buttons. There are no less than 4 external buttoned pockets, the lower are bellowed-type, plus one internal zippered pocket. 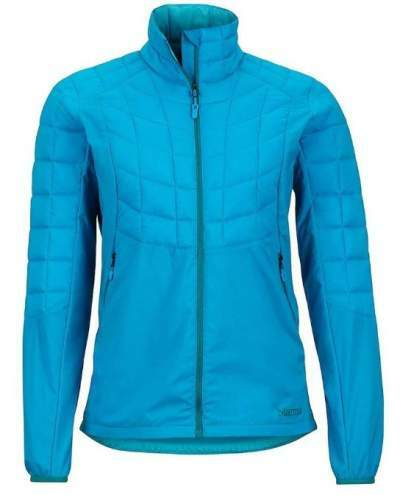 Marmot Women’s Featherless Hybrid Jacket. 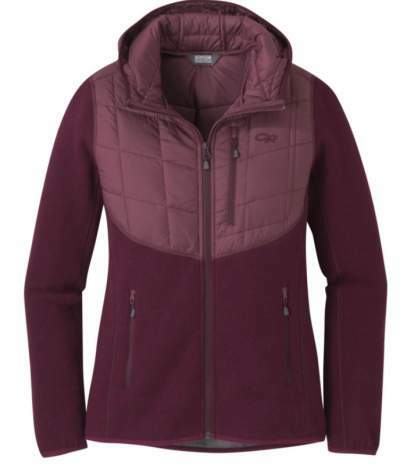 This is a light-insulated jacket and if used on its own it is best suited in between seasons. If you are puzzled by the word Hybrid in the name, the meaning is that you have the insulation on the main body area (shoulders, upper torso, and the top of the sleeves), while the rest is a stretchy fabric. The insulation is what they call the 3M insulation which looks like down but this is synthetic loose fill which mimics down on purpose. It keeps you warm even if it gets wet. The shell material is 100% nylon ripstop stretch, so this is a close-hugging fit that at the same time allows you to move freely without inhibiting movement. The lining is a DriClime bi-component wicking fabric that feels great next-to-skin. You have an elastic drawcord hem and elastic cuffs closure. There are two hand pockets and one of them doubles as a stuff sack for the jacket. All in all, this is an athletic fit that can be used over baselayers or on its own. Note that this is a rather affordable jacket. 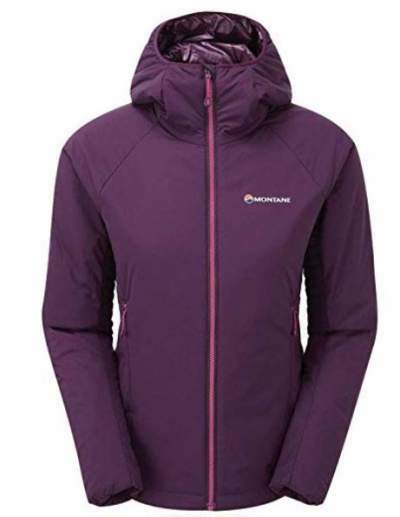 The Montane Women’s Prismatic Jacket is a lightweight insulation jacket with a Barrier Lite nylon mini-ripstop shell fabric 20D with a water-repellent coating, and with 40 g PrimaLoft Silver Eco insulation. If you are not familiar with this Silver term used here, please check my separate text about the PrimaLoft insulation. Here just to say this is one of the best, a polyester fill made from a partially recycled material. Inside, you have a featherlite Mini Rip-stop 20D nylon lining. The hood is a close-fitting design, adjustable, and with an elastic around the face. The cuffs are with elastic, the hem is with a drawcord, and you have two zippered hand pockets. Those are high enough to be used even if you have a hip belt on or a climbing harness. The full-length front zipper is a top quality YKK VISLON with an internal storm flap. This is a versatile jacket suitable for backpacking, hiking, climbing, mountaineering, etc. The fit is athletic and the center back length is 27.4 inches (70 cm). 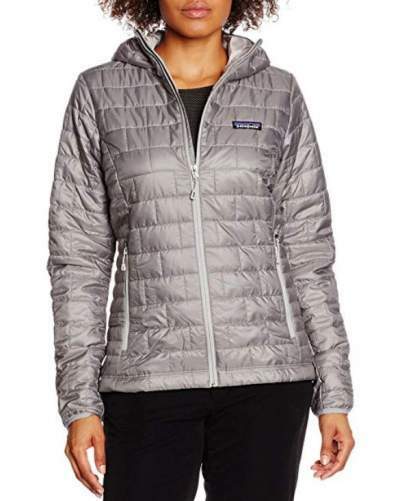 Outdoor Research Women’s Vashon Hybrid Full Zip. Perhaps you are curious about the word Hybrid in the name, so here you have something unique. This is a blend of synthetic and wool. The upper body, collar, lining, and hood are all polyester & nylon, while the lower body and sleeves are wool. So the ratio is polyester 48%, wool 37%, and nylon 15%. The baffles which you see in the picture are VerticalX synthetic insulation and you have it 60 g/m². This is a breathable and wicking, extra warmth and comfortable construction with quick-drying capabilities. A flat seam construction is applied to prevents chafing. An elastic drawcord hem is there to trap the heat. The jacket is with three zippered pockets, two hand pockets and one chest pocket. The weight for the size M is 17 oz (481 g) and the center back length is 26 inches (66 cm). The jacket is currently available in three different colors. The fit is standard and you can wear it with some low-profile baselayers underneath it, and you can also use it underneath a shell jacket. This is a versatile item suitable for hiking, backpacking, and a casual use. This Nano-Air Hoody comes with 60-gram FullRange 100% polyester stretch insulation that is placed between a 30D nylon ripstop shell and a 50D plain weave nylon lining. This is a design suitable for backpackers, climbers, for snow sports, and for a casual use, exceptionally comfortable, breathable, and lightweight. Both inner and outer fabrics feel very soft to the touch and they are with durable water repellent finish. The stretch feature provides a trim fit for an uninhibited motion and you also have an unprecedented air permeability. This is a hoody, so you have an integrated hood with elastic binding for a close fit without bulk. 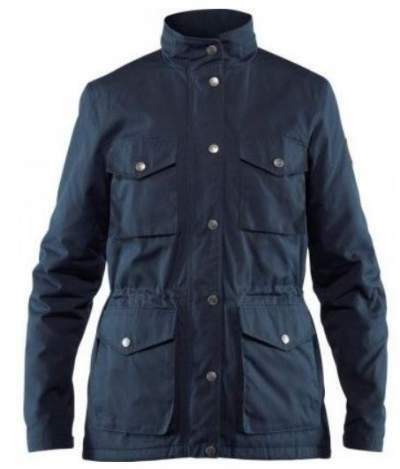 The jacket is equipped with 4 pockets and those include two high-set hand pockets which are usable even with a harness, one chest pocket, and one internal pocket. You also have a full-length front zipper, a dual-adjustable hem drawcord, and articulated patterning and quilting which improve the overall shape. 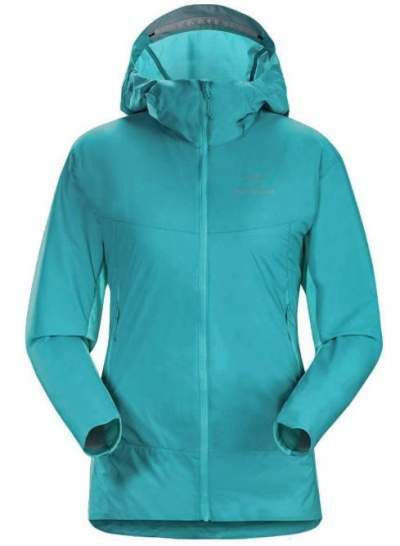 The Patagonia Women’s Nano-Air Hoody can be worn as an outer layer or under a protective hardshell over it. 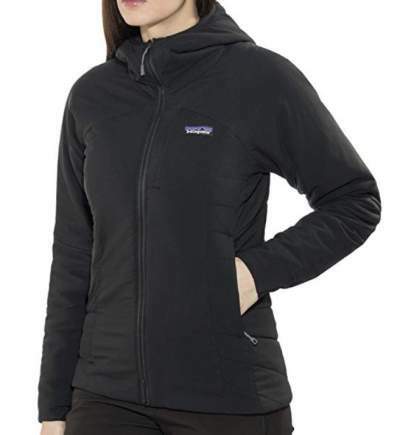 Patagonia Women’s Nano Puff Hoody. This is a jacket with the best ever insulation produced by PrimaLoft brand, in fact, you have the PrimaLoft Gold insulation here. If you are not familiar with this terminology, more is available in my separate text. Here just to stress that this implies water resistance, warmth without bulk, high breathability and compressibility, and softness. So this is a 60 g Eco insulation with 55% postconsumer recycled content, while the external fabric is a 100% recycled polyester shell and the same material is used in the liner. They claim that it maintains 98% of warmth even when wet. The fabric is Bluesign approved, the Bluesign Technologies is a Switzerland-based organization which provides independent auditing of each step in the textile supply chain. The style is such that it allows for some light layering underneath it. There are three pockets, two hand pockets and one internal pocket which doubles as its own stuff sack. As the name suggests, this is a hoody, so the hood is rather simple and without any adjustment elements, just a stretchy material around the face. It is low-profile and fits under any climbing helmet. 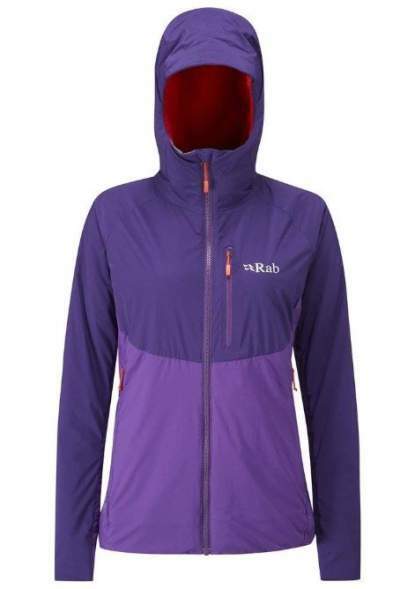 Rab Women’s Alpha Direct Jacket. This Rab Women’s Alpha Direct Jacket is very lightweight and breathable, with the Polartec Alpha Direct 120 synthetic insulation which ensures warmth even in damp conditions. This is a material that dries quickly if it becomes wet. The outer fabric is a wind- and water-resistant Pertex Microlight nylon fabric. The jacket comes with a low-profile but lightly-insulated hood which extends protective coverage for extra warmth, and it fits under a helmet. Note that you can roll it down and fix by a Velcro tab when not in use. This is a slim fit that can be worn over baselayers and low-profile mid-layers, suitable for alpine climbing or aerobic cold-weather activities in general. You also have an adjustable hem and stretch fleece cuffs, two zippered hand pockets, and one zippered chest pocket, all with the top quality YKK zippers. The front zipper is again a 2-way YKK full length with an inner storm flap and a chin guard. 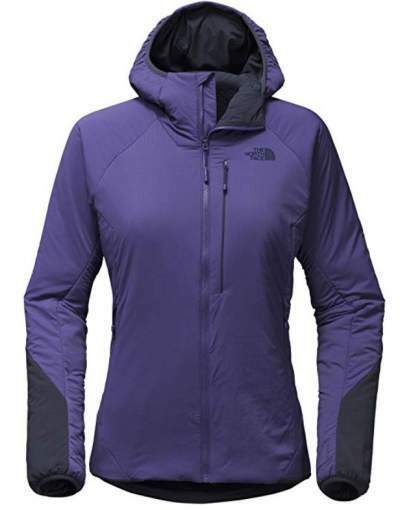 The North Face Women’s Ventrix Hoodie. The North Face Women’s Ventrix Hoodie is an award-winning jacket that allows the excess body heat to escape while you move but it works differently when you stop. The insulation is an 80 g polyester Ventrix stretch. This is a low-profile insulation that provides warmth even if wet, but this is the same for all the models here in the list. Different materials are used in different parts of the jacket’s body. The main part of the shell is 30D X 20D 92% nylon, and 8% elastane ripstop with a DWR finish. The arms are 50D X 40D 75% nylon, 15% polyester, and 10% elastane ripstop with a DWR finish. You have a bolstered fabrication on the forearms for an increased durability and abrasion-resistance. The liner material is 30D X 20D 92% nylon and 8% elastane ripstop. The jacket is with laser perforated key areas on the underarms to enhance the ability to dump excess heat. You also have an insulated close-fitting hood. The front zipper is a water-resistant and full-length VISLON. There are 2 zippered handwarmer pockets and one zippered chest pocket. The cuffs are elastic and the hem is with a cinch-cord. So all in all, this is a slim fit, lightweight and highly air-permeable item perfect for hiking and backpacking and the center back length is 28 inches (71 cm). So this was my list with some of the greatest synthetic insulated jackets for women currently on the market. I am writing this text as the winter is approaching and I notice that new models are appearing daily. No doubt some new jackets will be added to this list from time to time as I discover them. So bookmark this page and visit it again. Note that there is a specific group of insulated jackets described in my separate text, those are interchange jackets or 3-in-1 jackets as some call them. They are more than just insulated type, they offer a waterproof protection as well, so have a look there. But if you would rather have a down jacket, please see this list with best down jackets for women. If you need something for men, please check these insulated jackets for men.